Pattaya Centre Hotel, located in the heart of Pattaya, close to it's vibrant entertainment and shopping area, combines relaxation and excitement with first class hospitality and service all the year round. - Written cancellation by email/fax is required to E-Biz Travel at least 7 working days (Not including Sat, Sun & Public Holidays) prior to arrival date, Otherwise, one night room rate of total room reserved will be charged. - No Show : one night room rate of total room reserved will be charged. Facing the sea, the open-air swimming pool is the perfect spot for sun bathing or for those who enjoy an evening cocktail while watching the Sunset. Pattaya Centre Hotel proudly present our spacious Lobby where our friendly staff will attend to all your needs, you may greet your guests for coffee and drinks in a relaxing and comfortable fully air-conditioned environment. Offers the State of Art conferencing and Banqueting. 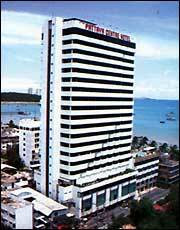 It also offers a complete Panoramic View of Pattaya Bay and city.